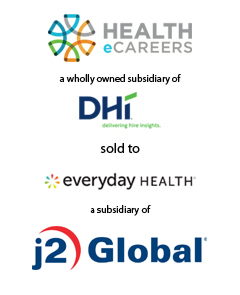 AGC Partners is pleased to announce that its client, DHI Group, Inc. (NYSE: DHX), a leading online career resource and talent acquisition platform for technology professionals and other select professional communities, has sold its Health eCareers business to Everyday Health Professional, a subsidiary of Ziff Davis, LLC that is wholly-owned by J2, for approximately $15 million in cash. The transaction closed on December 4, 2017 and DHI used the proceeds to reduce the balance on its revolving credit facility and support strategic initiatives. The acquisition enhances Everyday Health’s capabilities in digital health marketing and communications solutions targeted to healthcare professionals. With a team led by Elena Marcus, Greg Roth, and Trevor Martin, AGC Partners acted as the exclusive financial advisor to DHI.